A public reading session marked the launch of the event. 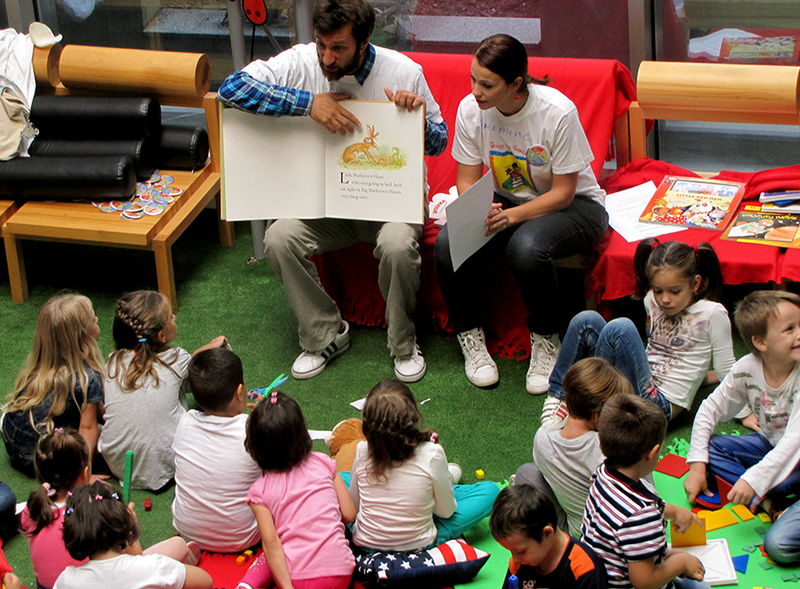 On September 12 2013, the Foundation for Education and Cultural Initiatives “Step by Step” – Macedonia officially launched the USAID Readers are Leaders Project for the general public in Macedonia. The USAID-funded Readers are Leaders Project is a thirty-month initiative which started in May 2013 and ends in November 2015. It is being implemented by NGO “Step by Step” Macedonia. The broad goals of the project are to improve early grade reading and numeracy assessment; strengthen teachers’ pedagogical skills, especially in diagnostic and formative assessment; and increase community recognition of children’s of reading and numeracy skills. “Step by Step” – Macedonia partnered and jointly defined these aims together with the Bureau for Development of Education and the National Examinations Center in order to provide institutional support and sustainability of project initiatives. Project activities primarily engage early grade teachers, school pedagogues and psychologists from selected schools in the country, as well as representatives from state educational institutions, and are aimed at addressing the needs of the following beneficiary groups: children in the early grades within the formal education system; children from vulnerable groups, children with special needs and residents in remote rural areas, and children residing in institutions, including hospitals and orphanages. Through the Readers are Leaders Project, Early Grade Reading Assessment (EGRA) and Early Grade Math Assessment (EGMA) is implemented for the first time in Macedonia, which will provide a clear overview of the current status of students’ reading and math performance and can influence the policy dialogue for improving the teaching practice in the schools. However, it is not only up to teachers, schools or governments to deal with literacy. Literacy skills touch many aspects of our daily interactions and a broad range of players have their roles to play in building a culture of reading in Macedonia. Therefore, Readers are Leaders Project uses innovative and creative initiatives to engage students’ families, local community and the general public. A Reading Road Show, Magic Literacy Van, and digital repository for appropriate learning materials are just a few of the available initiatives and tools. For more information regarding project activities, please refer to “Step by Step” Macedonia website or the USAID Macedonia official website.